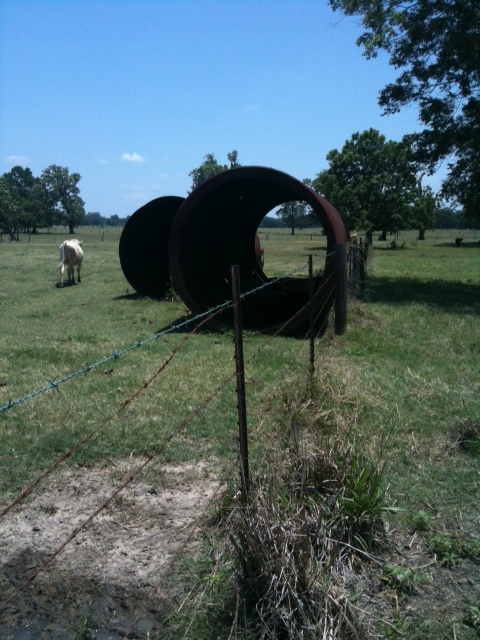 Who knew contemporary art lived at ‘Bout Time Ranch! I spent the Memorial Day weekend at ‘Bout Time Ranch where I looked at deer and sat on my parent’s back porch in a rocking chair. I couldn’t help but notice, however, how much of what I saw there reminded me of some artists that I am interested in. 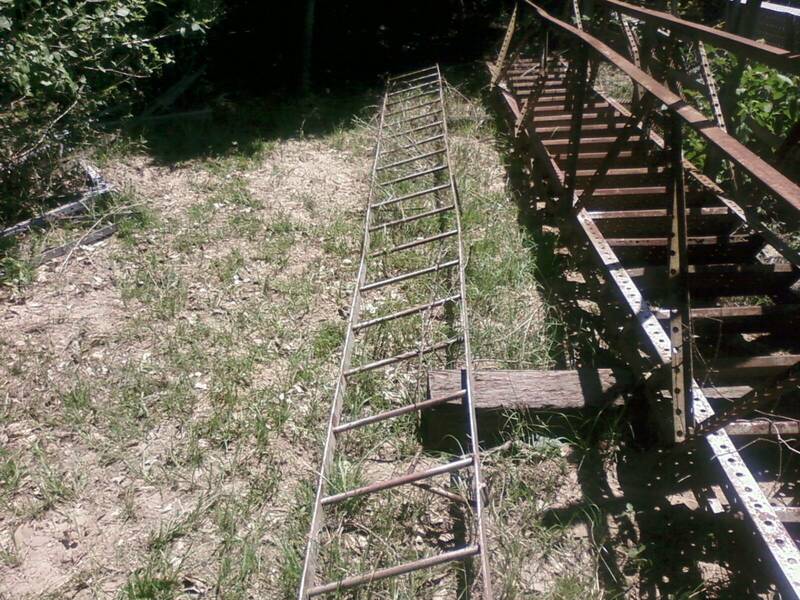 So, use your imagination and see if you can recognize famous artist elements in these photos. 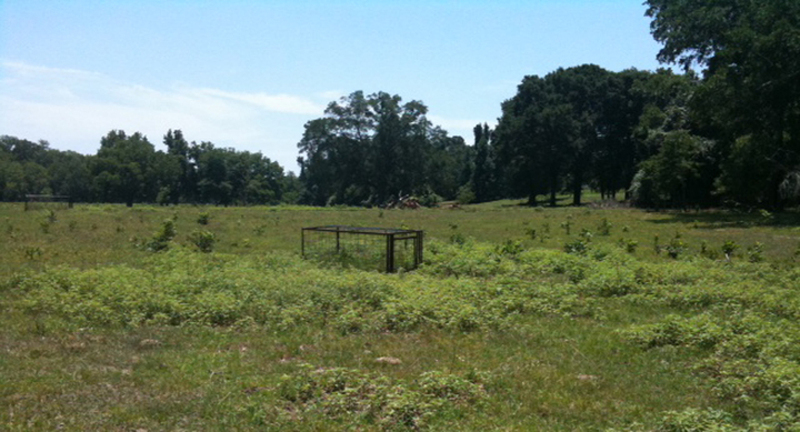 Here is a hog trap in the middle of the pasture. 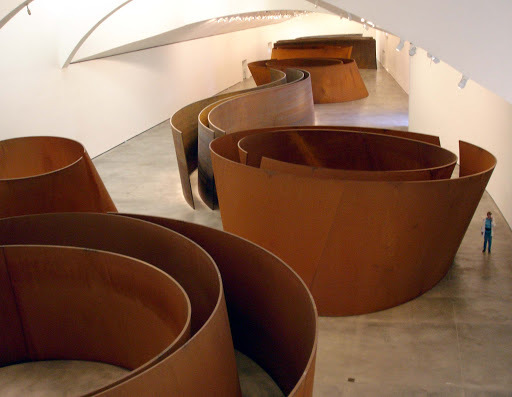 Doesn’t it’s geometric shape sitting lonely amidst the organic world remind you of Donald Judd installations? 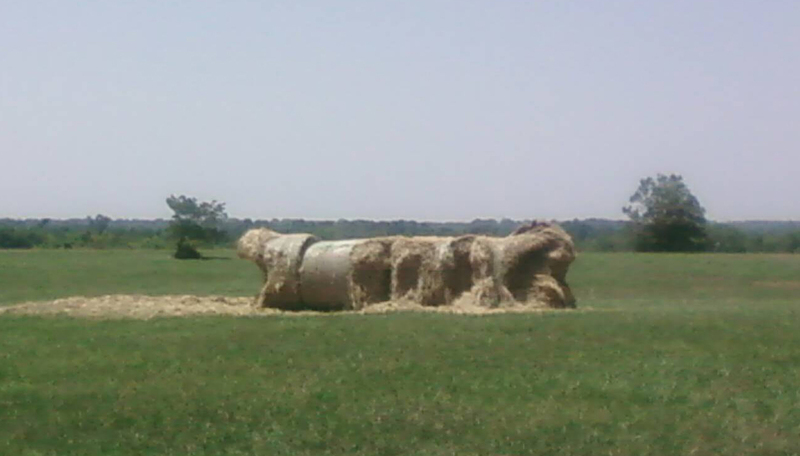 Here is a series of hay rolls that have sat in the sun, been eaten by cows and appears to be wilting. Doesn’t this seem to bring to mind the piece I posted a few days ago (Keith Bentley ”Cauda Equina”)? They look like Richard Serras in the making, right? Last but not least, let’s take a look at a pile of limbs and brush that is waiting to be burned until the bans are lifted. This was a very fun project for me this weekend. I spent one afternoon riding around in the truck with my Dad as he helped me find the best shots for this post. As usual, my Dad rocks. Hope everyone had as good a Memorial Day as I did. I really love how you look at nature and say “This reminds me of art,” and not the other way around! You have such an amazing eye! Your ability to view art and nature is truly inspiring!! I could never imagine looking at things so seemingly ordinary (growing up in Texas, we see these things quite frequently)and seeing works of art to compare them to. I should have you look at William’s artwork and tell me which artist he favors. LOL. It sounds like you and your father had a great time being waaaayyyy more productive than most people. And using much more brain power.